From now until 23:59 (UK time) on Friday 12th April 2019 you can get three Doctor Who adventure double bills, Alien Heart / Dalek Soul, Shadow Planet / World Apart and Vortex Ice / Cortex Fire with 50% off. Head to the exclusive access page at www.bigfinish.com and use the unlock code WEBSITE50 to add these stories to your basket at the special offer price. These three standalone titles are a great listen for someone who hasn’t had a chance to experience Doctor Who on audio yet. 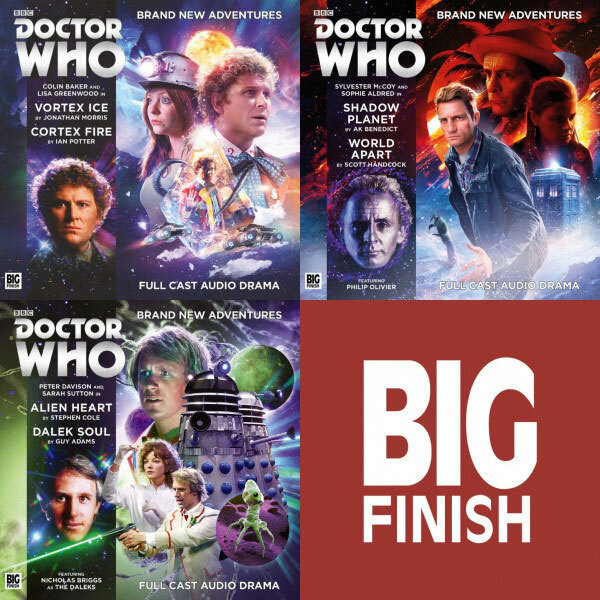 Unlike a regular Big Finish adventure, these releases all contain two stories – and they’re quite different to anything you’ve heard before.